Chumash Painted Cave State Historic Park is one of the few protected places visitors can experience some of the beautiful cave paintings of the Chumash people. The paintings (called “pictographs,” or painted drawings) are a reflection of the complex society developed amongst the Chumash people over the course of thousands of years. Before European contact, the Chumash people had settled along the coast from Malibu to San Luis Obispo and inland to the southern slopes of the San Joaquin Valley. They had been primarily hunter-gatherers who created bustling villages and towns connected by elaborate trade networks. Chumash society was structured and tiered, with a chief, or wot, governing one or several villages. The position was hereditary along the male line, although sometimes a daughter or sister could inherit the role. Primary responsibilities of the wot were to oversee access to food and resource gathering areas and to sponsor ceremonial gatherings. These fiestas were managed by the paxa, who was the leader of the ‘antap society, a group of high-ranked men who performed at fiestas and were the keepers of religious knowledge. Marriages, often arranged at the fiestas, cemented sociopolitical ties between villages situated in different ecological zones so that populations had access to a wide range of resources. In addition to leadership positions, Chumash society included a number of non-hereditary specialist roles, such as canoe captains, curing doctors, undertakers, bead makers and shamans. The priest, or shaman, was responsible for tracking astronomy and astrology, naming children and administering religious rites. 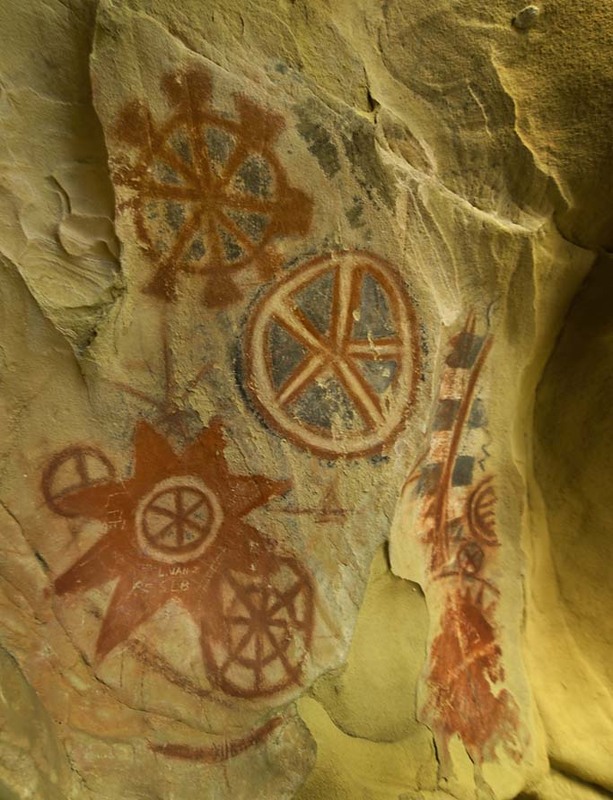 These rites included painting representations of Chumash cosmology on the walls of caves and rockshelters located at or near places of power, such as those seen at Chumash Painted Cave State Historic Park. The paints used to create the images were made from charcoal or manganese (black), hematite (red), limonite (yellow), diatomaceous earth (white) and even serpentine (blue or green). These earth pigments were ground in small paint mortars and mixed with a binder, such as plant sap or egg white, and applied to the surface with brushes made from yucca fibers or soap plant, or simply a sharpened stick or finger. Although the meaning of many of the paintings was a deeply personal experience to the person who created them, several common design elements are found throughout the Chumash territory, including crosses, spoked wheels, zigzag lines, and insect-like figures. Often artists would paint over earlier images in different styles. The paintings continue to be meaningful to the Chumash people today. Pictographs are subject to natural wind and water erosion, but human-caused vandalism has taken the greatest toll. Painted Cave is one of the best known rock art sites in California, and early Santa Barbara settlers began inscribing their own markings onto the paintings. A concerned local resident was able to arrange for installation of the locked iron gate in 1908 to better protect the precious Chumash art. Visitors who trek up the steep path to see the cave paintings are viewing an important and beautiful piece of Native California Indian heritage which should be respected for all people to experience.